1. Preheat the oven to 190ºC, gas mark 5 and line 2 baking trays with baking paper. 2. Cream the butter, sugar and vanilla together until light and fluffy, and then sift in the cornflour and plain flour and gently mix until it forms a soft dough, adding 1-2 tsp water if too crumbly. You might have to squeeze the dough together with your hands. Wrap in clingfilm and chill for 20 minutes. 3. Roll out the dough to a 5mm thickness and use a 2.5cm round cutter to cut out tiny biscuits. I use the base of a metal piping nozzle. Arrange on the baking trays and bake for 8-10 minutes until cooked but not browned. They should hold their shape but remain soft. They will harden as they cool. 4. While the biscuits are cooling, make the topping. Whisk the royal icing sugar and 1 tbsp cold water together using an electric whisk until stiff peaks form, around 7-8 minutes. Add a little more sugar if it looks too wet, or a little more water if it seems too dry. If using, colour with food colouring gel to create a pastel shade. 5. 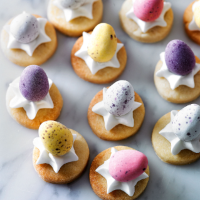 Use a piping bag with a small closed star nozzle to pipe icing onto each biscuit, then stick a chocolate mini egg onto each one. Leave to harden for at least 2 hours before eating. These will keep in an airtight container for up to 2 weeks. This recipe was first published in Thu Apr 06 10:59:00 BST 2017.